The caring and experienced professionals at Elliott Mortuary are here to support you through this difficult time. We offer a range of personalized services to suit your family’s wishes and requirements. You can count on us to help you plan a personal, lasting tribute to your loved one. And we’ll carefully guide you through the many decisions that must be made during this challenging time. 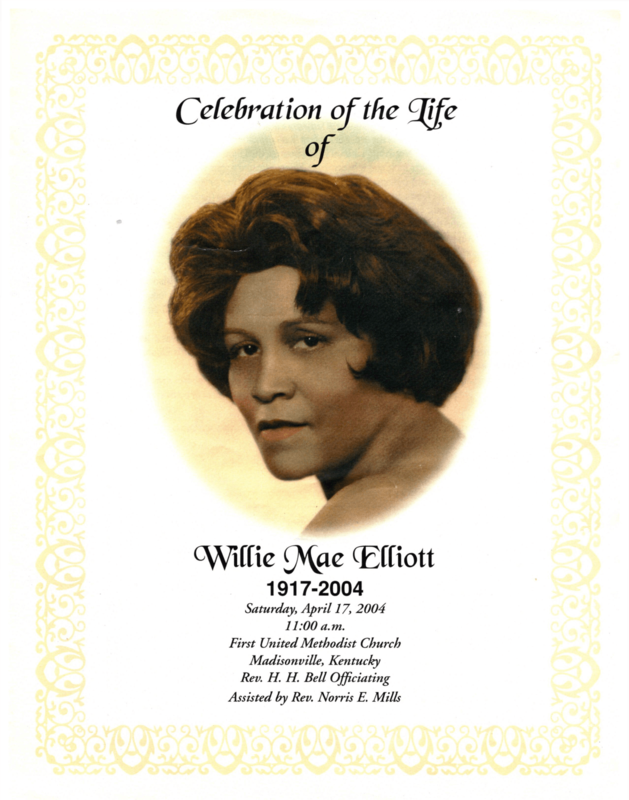 Willie Mae Elliott was born in Madisonville,Kentucky on April 24, 1917. She was a class of 1939-1940 graduate of Gupton-Jones College of Embalming and Mortuary Science in Nashville,Tennessee. She was licensed to embalm and direct funerals in Kentucky, Tennessee, and Indiana. She served as past president and secretary of the Kentucky Association of Morticians, Inc. She received certificates from the Tennessee Board of Funeral Directors and Embalmers. She earned academic medals in reconstructive arts. She almost never conducted a closed casket funeral due to reconstructive techniques and new materials to build tissues. She was a perfectionist when it came to her profession. In 1941, she purchased property from P.G. Poindexter at the corner of North and Laffoon Streets which became the Elliott Funeral Home. In 1972, a new funeral home was built and it became the Elliott Mortuary. She owned and operated the first private EMT Ambulance Service in Madisonville. She started the first funeral limousine service in Madisonville. In 1980, she opened Elliott Memorial Gardens, a cemetery off North Street becoming the first and only funeral home presently to own a cemetery in Madisonville. She was a Civil Rights Activist, being the first funeral home to bury an African American in the Odd Fellows Cemetery in Madisonville. She was a pioneer in the Civil Rights movement and served as president of the local chapter of the NAACP working in the state association. "She is sadly missed but her legacy continues".